Guest list, wedding dress, location, food, music… weddings today want to be planned almost with military precision, because the best day in your life should be as unique and perfect as you as a couple – that’s the theory. But more and more couples are scraping all the planning and politics of a big wedding, and making a break for it, with something a lot more intimate, an elopement. 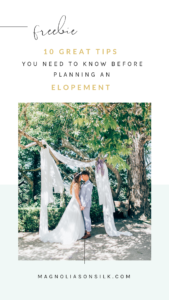 “To elope” literally means to “run away”, but nowadays the meaning of elopement changed and describes a very small wedding (just you and your partner and maybe a few witnesses). Whatever the reason you are eloping, and wherever you are eloping to, it’s still just as important to make it special. In this article I give you ideas on elopement destinations, let you know what you need to keep in mind when planning an elopement wedding and share our very private elopement story in India. When Marcell and I got engaged during Christmas 2009 we immediately decided to elope. And not just to a romantic place in Europe or to Las Vegas to get married in the first chapel we see with a Elvis double and a pink convertible – but all the way to India. India always had a special meaning to us. During one of our first dates Marcell gave me a book – Siddhartha by Hermann Hesse – and wrote some personal lines in the book: “In the hope to travel to India with you one day”. We spontaneously booked a flight to Delhi. During 6 weeks travelling we not only felt in love with this versatile and amazing country, it’s culture and people but also with each other. The rest is history. First we started looking for the right place to tie the knot. We knew we wanted to get married in an intimate ceremony by the sea. We love unique style and a creative atmosphere and did not want to end up in a hotel chain or resort with a ready-made wedding package. Eventually we came across a place called “A Beach Symphony”. Does not just the name sound promising? This beachside escape near Alleppey is a peaceful and exclusive hideaway with only four cottages set in a large lush garden full of palm trees and tropical plants on the shoreline of the Arabian sea. The perfect place to elope. This place is so special to us, it is engraved in our wedding bands instead of our names. To get everything organized from the attire to the ceremony, flowers, background music etc. was not as easy as I thought it would be. Not only that it is quite a challenge to source vendors in an area we were not familiar with, in a traditional country like India where still a good amount of marriages are arranged by the parents of the wedding couple and weddings are a big celebration with hundreds and sometimes a thousand guests the concept of two people eloping without their families sounds quite outlandish for locals. It all started with the date of our elopement. You cannot just get married on the date you are looking for. Before the wedding, an auspicious time (called muhurta) is fixed for the event. Using our dates of birth, an astrologist calculated the position of planets and stars to reflect the celestial union of us and chose the perfect wedding date and time for the ceremony. We are married for over 9 years now… seems like the astrologist chose the perfect date and time. We were lucky to have Christel and her husband, the owners of our little hideaway, who took care of everything before we arrived. They organized the brahman to hold the ceremony, took care of the decoration and the flowers, organized two ladies helping me to get dressed in my beautiful wedding sari and embellished my hair and neck with jasmine flower garlands. Our destination elopement in India was the best decision we could have made for ourselves. It was a trip completely about us and what we both wanted, and we didn’t have to worry about making anyone else happy. The only timeline we were on was our own. The memories we share from that time are so special and unique, they still feel like a dream when I look back. 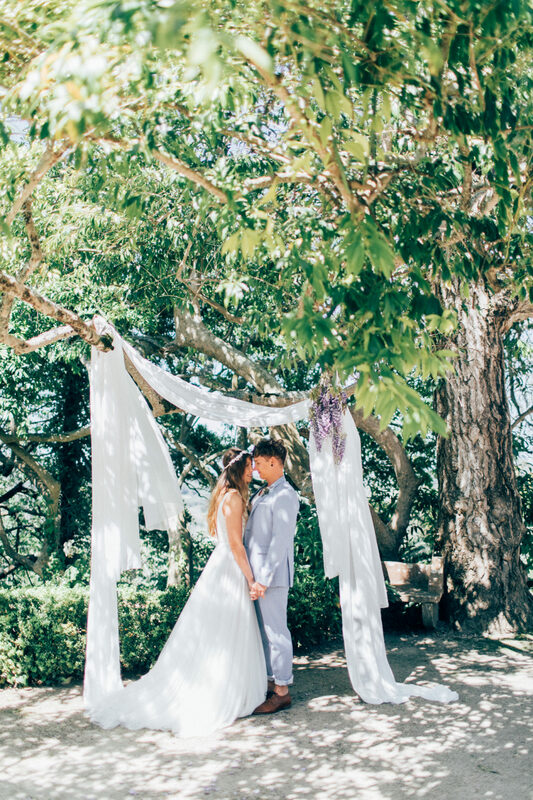 Whatever you are dreaming of, may it be standing on a mountain or on a secluded beach, breathing in the fresh air, feeling a soft breeze on your skin and looking in the eyes of your soulmate while reading your wedding vows. 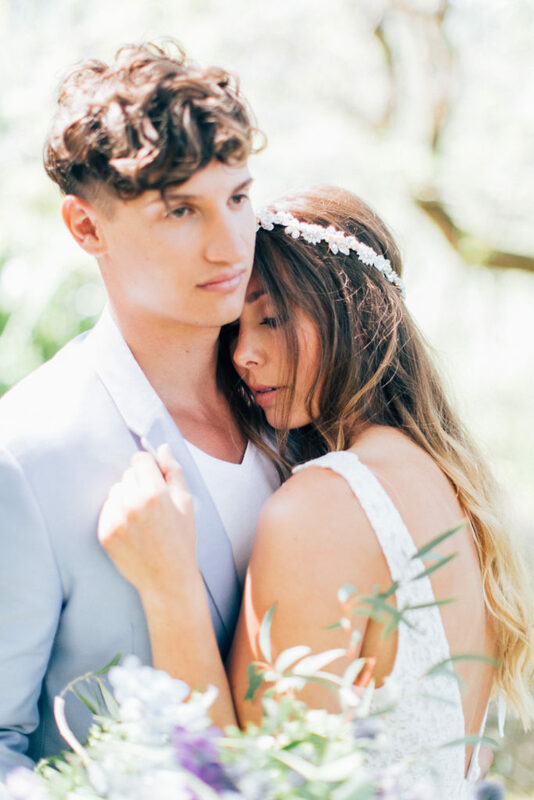 An elopement might be the wedding of your dreams. And it is understandable. You get to plan a day completely as you wish, while focussing on yourself and your partner and your love for each other. An elopement wedding can be anything you like. An exciting adventure in the nature or a relaxing escape from the stressful everyday life. Many couples decide to tie the knot in an other country. Collecting memories on an extraordinary place and sharing this experience with your significant other is the right start of a new chapter. Surely, you’ve heard of couples eloped to Las Vegas getting married in the next wedding chapel and get away with a pink convertible, right? If that is for you, perfect! Besides this classic there are many beautiful ideas of elopement destinations and you should choose the one that has a meaning to you and you feel connected with. With quaint landscapes and a romantic Italian flair is Tuscany a popular destination for couples. If you’d like to read more about the best wedding venues in Tuscany, then you should go and read this article! Besides, with stunning sceneries, wonderful beaches and great weather Portugal is a great destination for an elopement wedding. Would you like to get a better idea of this secret destination wedding tip, then you should read our article 5 Tips for Getting Married in Portugal and the Best Locations. Santorini is becoming rapidly one of the most popular destinations for an elopement wedding in Greece. The island has a reputation for being one of the most romantic places in Europe and beyond. Clusters of whitewashed houses, crystal clear blue waters and picturesque sunsets that spill onto the coastline as you gaze into each other’s eyes and say ‘I do’, could it get more romantic? If you are dreaming of a wedding in Greece read our article Greek island dream: The perfect Santorini wedding in 5 steps to find out more about getting eloped in Santorini. 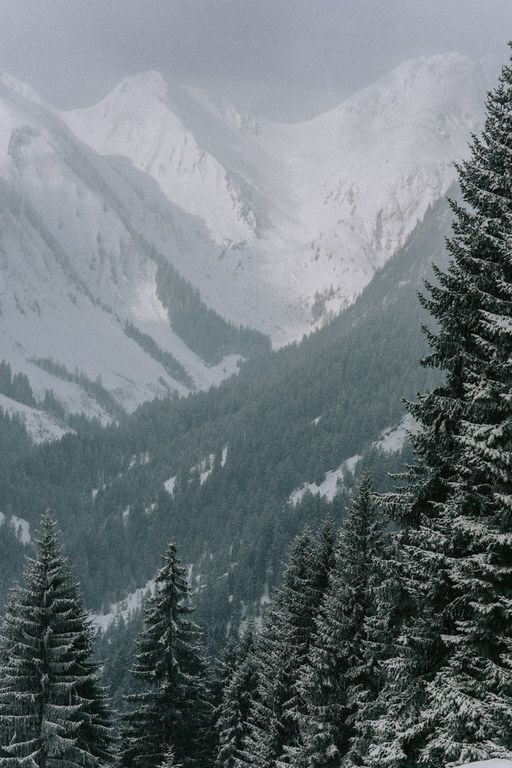 Or are you dreaming of a romantic winter wedding in a private chalet in snowy mountains? 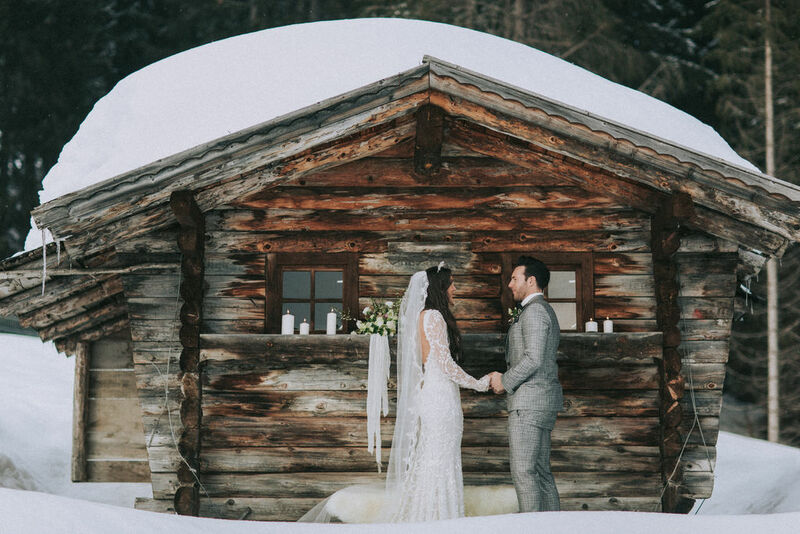 Have a look at this amazing elopement in the Austrian Alps and make sure you do not miss the video and I am sure, your eyes won’t stay dry. And of course, what could be better than a wedding in the city of love, Paris? Tropical islands like the Caribbean, Hawaii, the Maldives or the Seychelles know how to impress with their beautiful beaches. No wonder many couples head there for their honeymoon. Therefor it could be a good idea to choose the destination where you would like to spend your honeymoon. Because your honeymoon can start right after the ceremony! To rent a big wedding venue just for the two of you can be quiet pricey and might let you feel a bit lonely and lost. For this reason, cozy chalets and lodges are great elopement venue alternative. How about a luxurious chalet in Afrika in the middle of the savanna? Or a small private cabin in the mountains? Or maybe a lovely English cottage? The options are as versatile and individual as you are as a couple. Some hotels and resorts even offer elopement wedding packages, that include a romantic dinner on your private balcony or terrace. This way the wedding can be intimate as a whole, not just the ceremony. The wedding vendors you will need depend on your expectations of the elopement. Renting a band might be overstated, but some background music for your ceremony or your dinner doesn’t sound that bad. You also might need a make-up artist and a celebrant or officiant for your wedding ceremony. And just like a normal wedding would have a bridal bouquet and floral decoration, you should think of a florist. Especially when marrying in a very secluded way, photos are perfect to create memories and show friends and family what your day was like. There are wedding photographers who are specialized on elopement weddings and we would highly recommend investing in one of those. Keep in mind that an elopement does require planning and organization. 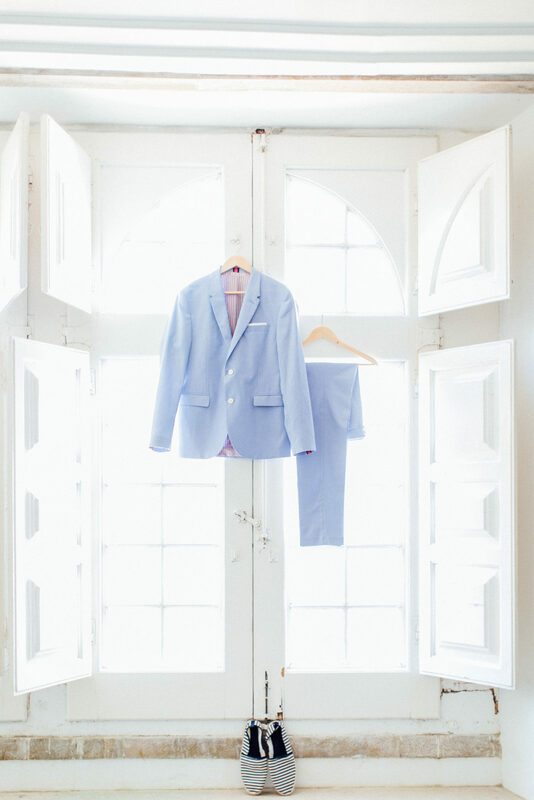 Especially when planning a destination elopement, a wedding planner is an investment that saves you time, nerves and some maybe expensive or frustrating mistakes. If you need help planning your perfect elopement in Europe, schedule a FREE consultation call with us. 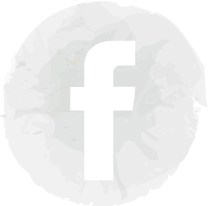 We have a large network of the best wedding vendors in the most beautiful European wedding destinations and help you to make your dream come true. Planning an elopement wedding can be a huge challenge. We do it in this guide – a free download we have made just for you.